Getta Gripp is More than just an Athletic Grip! I was at a diving meet recently and during warm-ups, a young man was attempting a back two and half tuck on 3-meter springboard. He initiated his take off and jump, but when he attempted to connect into his tuck position, his hands slipped straight off his shins. Luckily, he was able to finish his dive without physical injuries, but his confidence and trust in the dive was lost. Coming over to his coach, we introduced him to Getta Gripp. Regardless of the misfortune of what happened on his previous attempt, this time he had the comfort of knowing he had Getta Gripp. He went through his same take off, but this time…he did not slip and he was able to successfully execute the dive. Getta Gripp, as simple as it may be, not only physically assists athletes, but mentally gives them confidence to attempt new skills and dives that previously scared them. 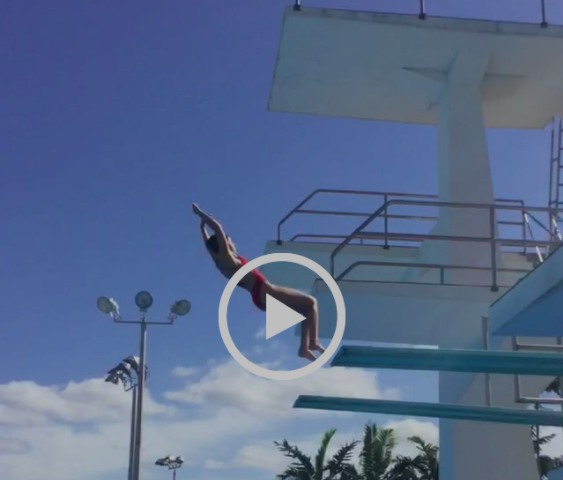 Here’s a video of a club diver in the early stages of learning a back two and half tuck on 3-meter. Bubbles aside, she made sure she had her Getta Gripp applied to give her the assurance that she would have a safe grip to complete the dive. Regardless the sport, Getta Gripp can be there to help physically or mentally! If you know an athlete who needs that extra bit of a safety or confidence, Getta Gripp is your solution!